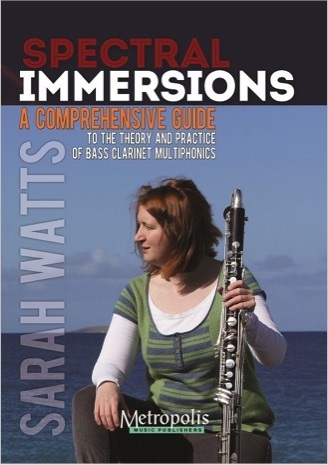 Sarah's PhD was an extensive research looking at bass clarinet multiphonics. She has created new multiphonics charts for the bass clarinet and commissioned new works for bass clarinet that use her new charts. The book contains history, analysis, new charts and new compositions together with audio and data CDs. A separate series of works written for the project will also be published alongside. Please see contact Sarah for further information on this project and for Recital, Lecture and Workshop packages aimed at Educational Institutes. - 2013/14 and onwards: Screapadal with full narration is now a part of ‘Horizons’ a new programme of music and words for clarinet and bassoon, with the bassoonist Laurence Perkins. - July 2015. Spectral Immersions and a selection of pieces published and launched at the International Clarinet Convention in Madrid.